In the past, I have written about the disadvantages of physical disabilities when it comes to carrying a concealed weapon. I also talked about how I have been on crutches for a couple of years. I did not receive my conceal carry permit until recently, but the issues that go with the crutches while carrying have been in the back of my head for a long time. 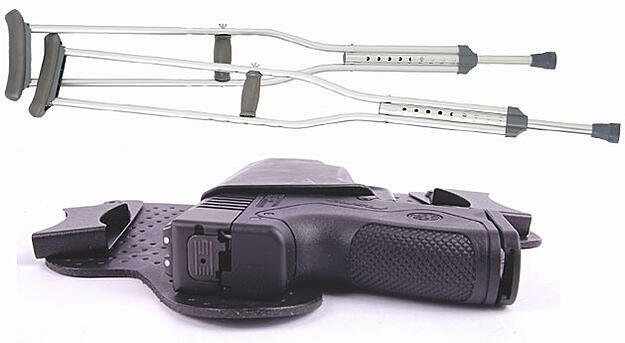 Being on the crutches presents three major problems when it comes to concealed carry. First of all, being on crutches partially lowers your situational awareness. We all know the best way to stay out of trouble is to be aware of what is happening around you and avoid potential problem situations. Using crutches takes away from a person’s situational awareness to varying degrees depending on where you are. You have to keep your attention on not catching a crutch on a curb or crack or on not putting a crutch down on a slick surface or in a hole. The plus side to this problem is that you also have to watch out for other people because they are not paying attention to you which is why this only lowers your situational awareness slightly. Second, the crutches are simply in the way. You need at least one free hand to draw your pistol and in some suggested tactics, you need two. You have to drop or otherwise get the crutches out of your way before you can draw a pistol. I guess you could always throw a crutch or cane at your attacker before drawing. Or not. Up to you. I need to figure out how to get the crutches out of my way while simultaneously making sure that they do not interfere with drawing my pistol. This is going to take some trial and error and a lot of practice which is what a lot of you suggested that I do in your comments about my last post on Beretta's Facebook page. Third is the issue of balance and mobility. Once you have the crutches out of your way, you have basically locked yourself into an immobile situation where your main tools of balance and mobility are laying on the ground. I can stand on my bad leg and even take a few steps without crutches so I can still shoot from a balanced position. But there are people who can’t do that. What do they do? Best option I can come up with right now is to Stop, Drop and Shoot. Maybe I should apply for a trademark for that and start teaching it? I’m going to try it the next time I practice and see how it goes. The United States Concealed Carry Association (USCCA) website www.usconcealedcarry.com has some good articles on concealed carry and shooting with a physical disability here and here.